I AM ARG! - Legos! Oh we have one of those. excess stashes I mean. so many fond memories of trading pieces and buildings houses. I owned a weapons shop in lego land! I used to make castles like crazy. I should take a photo of some of my collection. My husband and I bought 1200 legos this Christmas just so our past selves would be jealous of our kids. As a former legomaniac adult-parents of young lego maniacs – who yes, inherited a STASH… you haven’t lived till you’ve stepped on a single-pip brick bare foot in the dark. They are of course the most rigid objects in the universe and the perverse little hypercubes some manage to land with all six corners facing UP… Need frakkin’ surgery to extract them. Who cares about lego!… Check out the TNMT shirt! You’re only too old for Legos if you’ve grown a pedostache. My nephew got the stack of legos I used to have as a kid. He absolutely loves legos and builds sets meant for kids several years older than he is. 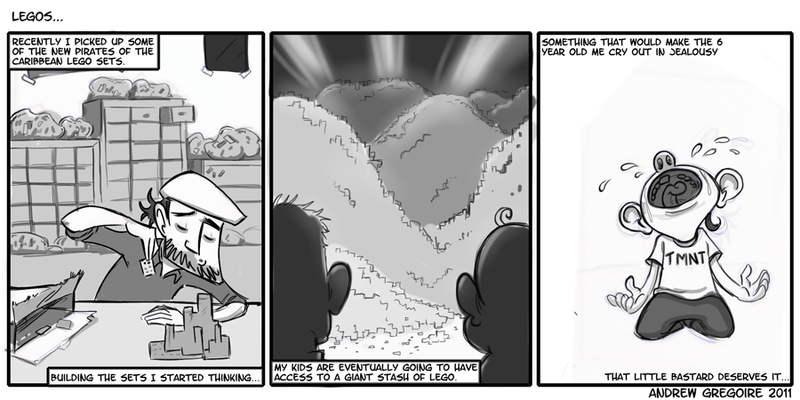 hahah, Lego is like a Family Heirloom now. It can keep getting passed on to the next generation, and it just continues to grow. My four year old just inherited my stash, and his has now begun to grow, at a faster rate than even mine did. I don’t have a huge collection, but I’m looking forward to passing it on if I have kids. It’s just one big tub of all the sets I had (minus a couple) tossed together. I still have most, if not all, the instructions for the sets though. I’ve actually just recently started getting back into picking up the occasional set, starting with getting some retired sets off ebay. I am part of club of Adult Fans of LEGO called CactusBrick. You buy more LEGO from Bricklink it is the online marketplace to buy LEGO. Thousands and Thousands of Pieces!! !